Mary Lou Quinlan is an author, actor and advocate for women. She has written inspirational features for Real Simple, O, the Oprah Magazine, and MORE magazine and is the author of the books Just Ask a Woman, Time Off for Good Behavior, and What She's Not Telling You. 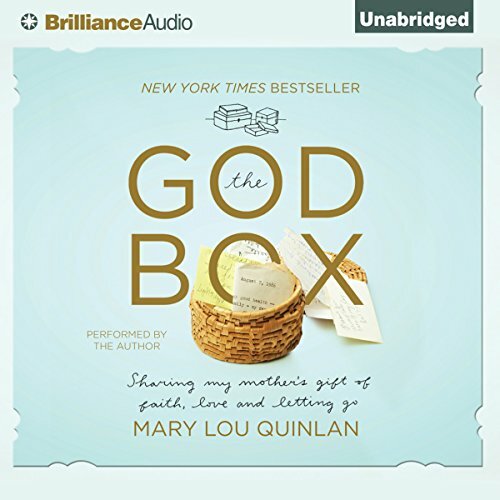 Mary Lou's latest venture is The God Box Project, led by her keepsake memoir of her mother, The God Box: Sharing my Mother's Gift of Faith, Love and Letting Go (Worthy Publishing, October 2012.) She also co-wrote The God Box, A Daughter's Story, a solo show she has performed around the US and is taking to the Edinburgh Festival Fringe 2014. The God Box Project also includes a free mobile app on iTunes, a series of short films and a vibrant online community, all built around Mary Lou's remarkable discovery of her mother's unique ritual for resolving her most heartfelt wishes and worries. She is the founder of marketing and production agency Just Ask a Woman. She has keynoted hundreds of conferences around the world; has appeared on The CBS Early Show, Good Morning America, and the Today show; and has been profiled in The New York Times, the Wall St. Journal, and USA Today, among many other media outlets. She holds honorary doctorates from five US universities. Mary Lou is Jesuit-educated with an MBA from Fordham University and an honorary doctorate in communications from her alma mater, Saint Joseph's University in Philadelphia, where she earned a BA in English. She and her husband, Joe Quinlan, live in New York City and Bucks County, Pennsylvania, along with their dog, Rocky.